Use baking soda along with a few drops of lemon juice for massaging the teeth. As the lemon juice is acidic you must be careful and rinse your mouth after using it so that you protect your teeth enamel against corrosion. Mix 1 Tablespoon of Lemon juice with 1/2 Tablespoon of salt and apply on teeth to remove the yellowish tint. Strawberries are considered very effective for teeth whitening.They not only kill plaque causing bacteria but also work great to remove stains from teeth. Gently massage your teeth with mashed strawberries. After using them for teeth whitening rinse and clean your teeth with a regular toothbrush to completely remove the mixture because strawberries are acidic and may damage tooth enamel if allowed to remain on the teeth too long. Adding a drop of clove oil(long oil)to the brush and toothpaste also helps fight against tooth decay, aches and gum problems. The inner part of orange peel is excellent for making your teeth white.Rub the inner part of orange peel on your teeth for 3-5 minutes and then rinse off. (i)Avoid any foods that cause stains on your teeth like strong tea, acidic juices,and strong coffee. (ii)Avoid harsh or hard brushing because it may damage or erode tooth enamel. (iv)Eating an apple a day not only brings minerals and vitamins to your body, but also brushes your teeth and whitens them. 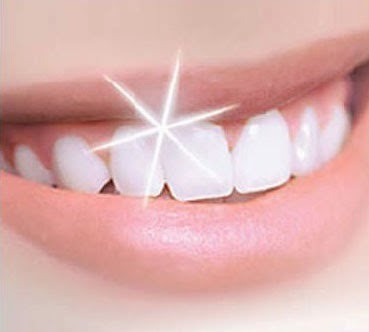 (v)Avoid smoking, red wine and all kinds of tobacco products that may leave stains on your teeth.